The demand for water in Illinois is likely to increase up to 50 percent in the coming decades, according to the State Water Survey. While Illinois is not currently facing a water crisis, highly populated areas with high growth – namely Chicagoland and Champaign County – are starting to see some levels of water conflict. In the past decade, communities across the state have spent hundreds of millions of dollars on potential solutions to projected water shortages and water quality issues. 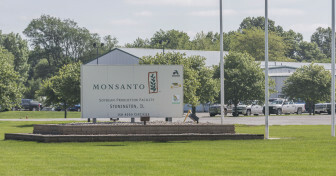 During the 2012 drought, crop yields fell, the Sangamon River ran dry, power plants had to reduce their production, the city of Decatur had to use its emergency water well, farmers had to liquidate some livestock herds and many private wells ran dry. Over the past five years, agriculture irrigation in Illinois has increased by 20 percent, equivalent to the use of more than half a million people. Illinois State Water Survey experts say the overall increase in demand for water could range from 20 percent to as high as 50 percent. Irrigation especially exacerbates these issues because its peak usage occurs when the need for water is highest. Irrigation systems are also intense users of water; the 70 irrigation pivots in Champaign County use more than double the amount the cities of Champaign and Urbana use in a typical day when they're running. During peak uses, irrigation systems can reduce water tables, meaning wells that aren’t deep enough often run dry. Because of these issues, Illinois is likely to see new regulations on groundwater usage in the coming decades, yet the lack of a state budget, the unwillingness of farmers to report irrigation totals and a lack of government oversight has led to planning issues. The local increase is happening as irrigation rises across the globe, increasing groundwater pumpage and reducing the world's aquifers, according to a study published in Nature. Mark Pflugmacher with irrigation equipment at his farm just outside of Gifford, Illinois, on November 29, 2016. 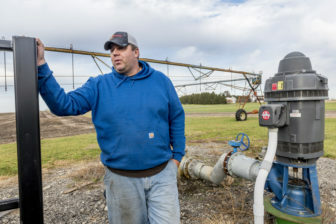 Almost 1,000 pivots – quarter- or half-mile pipe irrigation systems that turn in a circle sprinkling water on crops – have been installed across Illinois since the 2012 drought as a result of higher crop prices and the demand of seed corn companies. 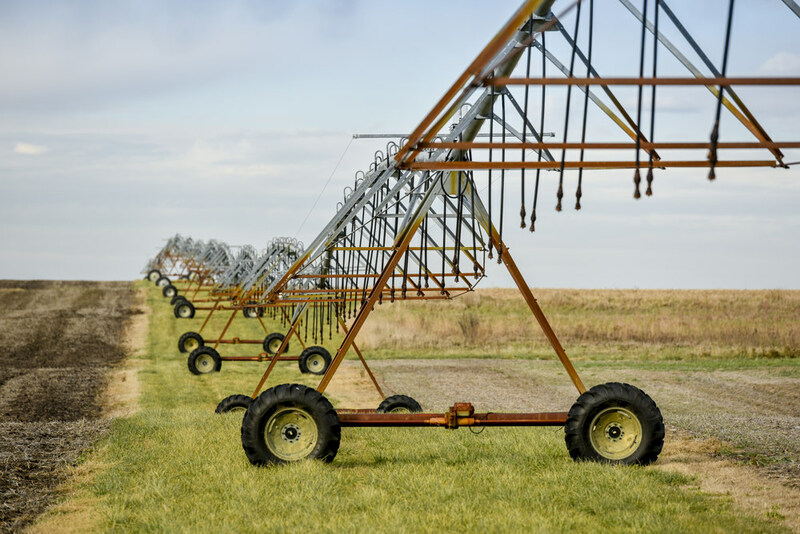 One of the driving factors behind the recent growth in irrigation has been seed corn companies moving toward growers that have installed pivots to help reduce the risk of losing their crops in a drought. 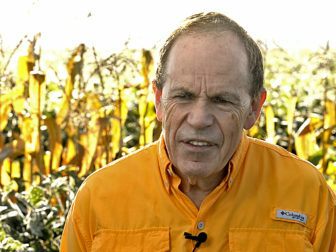 Dr. Stephen Long said irrigation may rise as the climate changes. 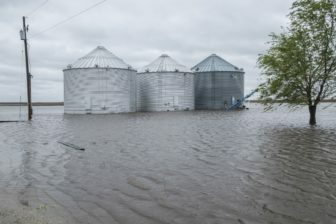 Experts warn that projected decreases in corn and soybean yields in the coming decades because of climate change could continue the rise in irrigation and drive up prices for farmland above aquifers. Highly populated areas with high growth in Illinois are undergoing some levels of water conflict, partly because of agricultural irrigation. 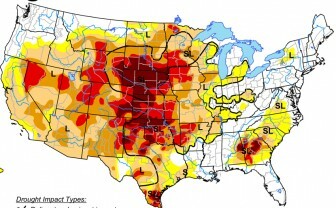 The U.S. Drought Map is produced in partnership between the National Drought Mitigation Center at the University of Nebraska-Lincoln, the U.S. Department of Agriculture and the National Oceanic and Atmospheric Administration.